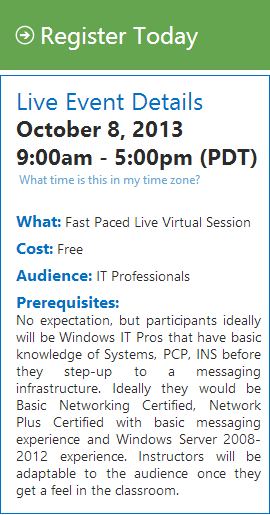 You can register to free Microsoft Virtual Academy Life Event about Microsoft Exchange Server 2013. During this session they will talk about below issues:. To register you need to have MVA account, but if you don’t you can easily create it. Tagged Exchange 2013, Jump Start. Bookmark the permalink. Hi, Excellent event. Will be recorded? they very often publish records from Jump Start sessions.